Triangle Veterinary Referral Hospitals (TVRH) are excited to announce that we now have a Criticalist on staff, in addition to the other specialties offered at our hospitals. In case you're scratching your head right now, a criticalist is a specialist. They're no different than an internist or surgeon; and in human medicine are often known as a hospitalist. Criticalists must finish a three-year residency at a recognized American College of Veterinary Critical Care (ACVECC) establishment. Usually, criticalists care for the most ill patients in the hospital, which end up being emergency cases predominately. Since our hospitals provide the next level of emergency care 24 hours a day, we felt it necessary to add Dr. Mike Nystrom to our team. Dr. Nystrom is graduate of the University of Tennessee College of Veterinary Medicine. Following graduation, he then went on to complete a one year internship at Tufts Cummings School of Veterinary Medicine in Massachusetts. After his internship he returned to the University of Tennessee to complete a specialty internship and then residency in emergency and critical care. Being a native of the Cary/ Apex area, he is very excited to return to the Triangle, with his wife and three kids. Triangle Veterinary Referral Hospitals (TVRH) are excited to announce that we’re working closely with Duke University as part of the Duke Comparative Oncology Group, in an effort to stop cancer. We are currently accepting dogs with Osteosarcoma into clinical trials of two new therapies. If your pup is a candidate, please contact Dr. Will Eward, Dr. Jennifer Arthur or Dr. Cindy Eward at our Durham location. You may either call (919) 489-0615 or send them an email to Oncology@Trianglevrh.com or Surgery@Trianglevrh.com. 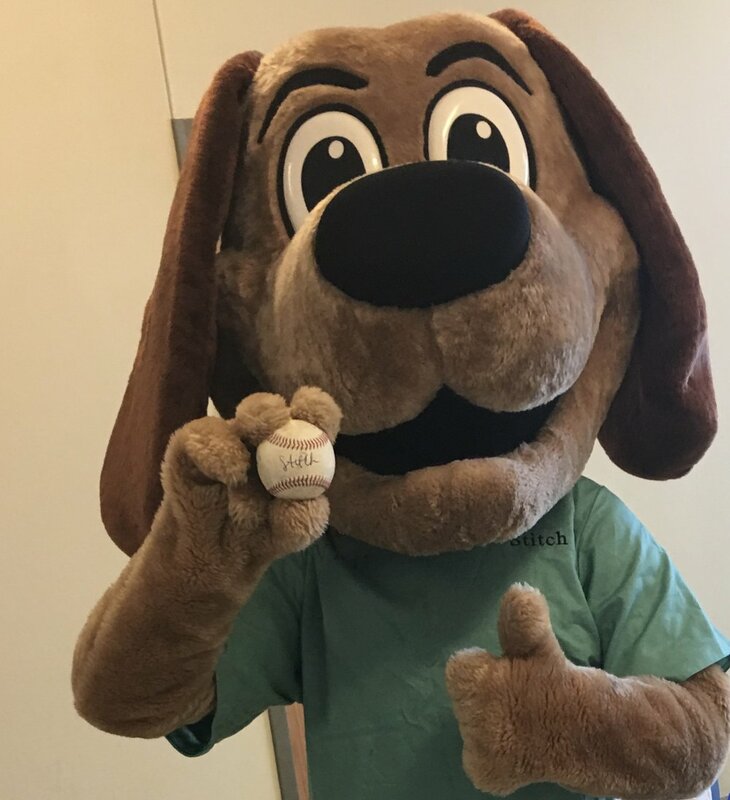 Stitch, Triangle Veterinary Referral Hospitals amazing mascot, nailed his inaugural base run of the 2018 Coastal Plain Summer League season! He faced off against Sal, the Salamander and a younger, fiercer opponent during the middle of the third inning on opening day at home, in Holly Springs. Although Stitch hit a home run with the fans, the Salamanders baseball team, didn't fare as well on the field. In front of a sold out crowd, of nearly 1,770 the Salamanders fell to the Marlins 7-4 in extra innings. Check out the Salamanders and Stitch for yourself at the next home game. Triangle Veterinary Referral Hospitals is a proud sponsor of the Holly Springs Salamanders. Click on the link below to see their next game! As summer temperatures continue to rise, North Carolina is beginning to see more snakes creep out of their holes. For people who own dogs, it can be even more frightening. Dr. Jeff Nunez, chief of emergency services at Triangle Veterinary Referral Hospital in Durham, said the summer months always bring in more cases of snake bites, particularly in dogs. "This is the time of year we start to see more snake bites," he said. "It's warm and the snakes are all moving around." Nunez said the central part of the state experiences the most venomous bites. "In general, Wake and Orange County are considered the state's top counties for venomous snake bites due to a large number of copperheads in the area," he said. Don't kill the snake. Many people tend to get bit when they try to kill the snake. Instead, try to take a picture of it or keep a mental image of it so the veterinarian can properly identify it and determine if the bite was venomous. Take your dog to a veterinarian as soon as possible. In the future, keep a close eye on your dog, especially when it's around bushes or wood piles. During the hot summer months, Nunez says he gets 3-5 dog snake bite cases each day. At the vet, dogs who have suffered a snake bite are either hospitalized and monitored for 12 hours, or they are given some immediate treatment, including antibiotics, and sent home. 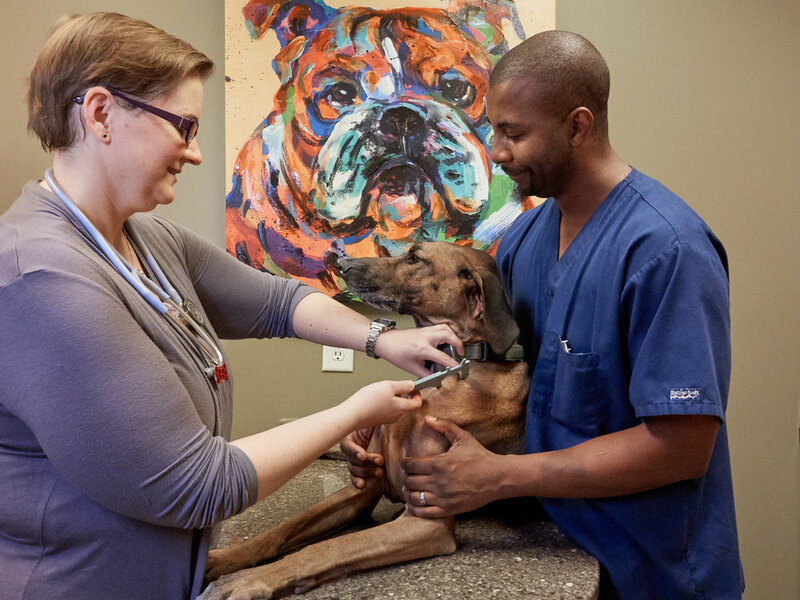 Dr. Anne Doherty Hinn, a Diplomate of the American College of Veterinary Dermatology, is now providing the next level of veterinary care to pets around the Triangle. Dr. Hinn earned a Bachelor of Science in Public Health and Nutrition from the University of North Carolina at Chapel Hill (UNC) and attended North Carolina State University (NCSU) for veterinary school. She completed two years of small animal private practice and then returned to NCSU to complete a residency in veterinary dermatology. Dr. Doherty Hinn is a Carolina native who proudly calls Raleigh home. Dr. Mike Grafinger proudly represented Triangle Veterinary Referral Hospitals (TVRH) at Spring Valley Elementary's annual Career Day. The yearly event, held in Durham, gives young students the chance to learn about various professions. Dr. Grafinger, one of TVRH's practice owners, shared about the road of a veterinary surgeon, which is rather lengthy. It took Dr. Grafinger 13 additional years of education, post high school. 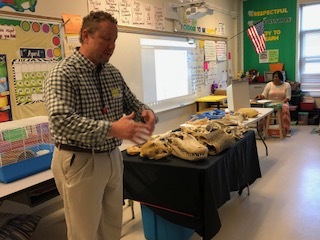 In addition to his account of being a veterinary surgeon, Dr. Grafinger also brought in live animals, several fossils and surgical tools to educate the students about his career path. 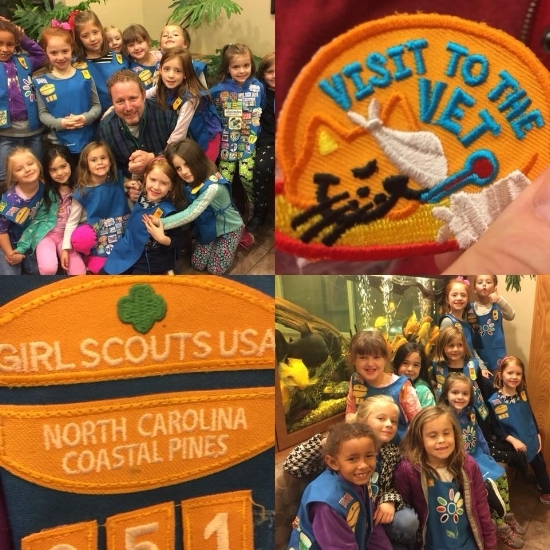 Triangle Veterinary Referral Hospitals (TVRH) are proud to announce Dr. Grafinger recently helped Troop 951 of Durham earn their Three Cheers for Animals badge. The budding Daisy scouts asked tons of questions about veterinary medicine and took an extensive tour of the Durham hospital. TVRH loves helping the community and values others. If we can help your organization learn more about veterinary medicine, please click here. Triangle Veterinary Referral Hospitals (TVRH) along with the town of Holly Springs hosted another successful Dog Day in the Park, a pet friendly event geared towards animals and their owners. The celebration featured trick dogs, canine first aid, food, music and plenty of contests for our furry friends such as Cutest, Ugliest, Best Talent, Best Costume as well as Dog and Owner Lookalike. In addition to these options, participants learned more about local businesses centered on pets and met dogs up for adoption! This was Triangle Veterinary Referral Hospital’s third year sponsoring the public event. Thanks to people in and around the Raleigh/ Durham area, Triangle Veterinary Referral Hospitals (TVRH) were able to greatly help the animal and human evacuees of Houston. Thanks to the overwhelming amount of donations at both locations (608 Morreene Road, Durham, NC; 2120 Werrington Drive, Holly Springs, NC), Triangle Veterinary Referral Hospitalswere able to fill a giant truck and transport it to Texas, courtesy of God's Pit Crew. In addition to the animal supplies, TVRH also raised money for the people! Triangle sent a major monetary donation to the Houston Food Bank. If you have any other questions about our Harvey Relief Efforts, contact our Communication and Marketing Specialist at (336) 749-3480.